First I have to aks, do you all like my new Favicon? That little image next to my blog URL? I love it. Thank you Kristen! Just the other day I hit 300 followers and before I could arrange for a giveaway I had SEVERAL more follwers! You all are amazing. :) So my way of saying thank you for sticking around and reading all of my ramblings is to give away a $15.00 credit to one of my favorite graphics site... Thistle Girl Graphics. I am sure you recognize her work from Ladybug Teacher's (Kristen's) blog designs. If you have not heard of Thistle Girl Designs, you have got to check her out. She makes the cutest graphics. I personally have had a Life Time Memberships for 5 years now and it is one of the best purchases I have made. 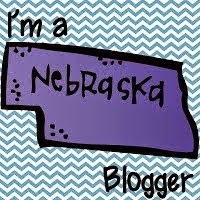 For all you blog addicts Ashley even has her own blog now too, Thistle Girl Designs Blog. Are you ready to hear how you can win a $15.00 credit to her store? Here is what you have to do. 1. Hop on over to Thistle Girl Designs, take a look around, come back here and leave a comment here telling me what you would buy with your $15.00. 2. Follow this blog and leave a comment saying so. 3. Hop on over to Thistle Girl Designs Blog and follow her too. then come back here and leave a comment saying so. 4. Help spread the word by blogging, posting on Twitter, or post on Facebook about this giveaway, (1 entry for each) come back here & leave a comment. In addition to my giveaway if you make a purchase from Thistle Girl Designs between now and June 30th, and mention that you came from Ms. K1ELL's blog, Ashley will put you name in a drawing to win a $25.00 gift certificate to her sight too! Isn't she sweet? Remember you have to say in your purchase "I came from MsK1ELL's blog". Here is a cute button you could use to help spread the word. Please make sure you leave a comment for each entry, for maximum chances to win. This giveaway will run until Monday , June 20, 2011 at 12:00 pm CST. I love the new favicon! Okay, from thistle girls, I love the Sea Mammals in the clearance section. I also like the Safari Babies Collection! I am now following the Thistle Girls Blog!! LUV the picnic pals at Thistle Girl design...she's one of my favorite clip art designers...just right for elementary teachers & their blogs. Wow! I might have to apply your giftcard towards a lifetime membership. Her stuff is so adorable! Love your blog! definitely a follower! I follow Thistle Girl's Blog! I would like to get the Dr. Seuss collection from Thistle Girl. SO hard to choose what I would buy!!! I love the Post Office Pals (because I'm going to do pen pals next year with my kiddos - hooray!) and I also love the School Sticklets. Those would be perfect for newsletters! 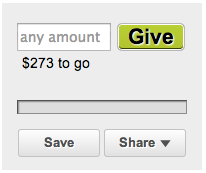 If I won the $15 credit to Thistle Girl's Designs, I would use that $$ towards the purchase of a Reseller's License. I already am a member of her site, but I would like to eventually use her adorable pictures on things to sell or share with others. I am already a follower of Thistle Girl's blog! Great give away! I already follow your blog and love it! I now follow Thistle Girl's blog!! I would use the $15 to buy the Froggy Friends and the rest towards the School Subjects Package deal. :-) Crossing my fingers!!!! I just blogged about your sweet giveaway and crossing my fingers to win! I would buy thistle girl's explorer bundle. So cute! I follow thistle girl designs blog through my google reader. Cute stuff! I would choose Seaside Sweeties. I follow your blog. Congrats on 300+ followers! I'm now a follower of Thistle Girl's blog. If I win the giveaway I would choose Seaside Sweeties. So cute! I'm a Ms. M follower! I've been loving thistlegirl designs from afar for some time, but now I follow her blog! Thanks!! If I win, I've definitely got my eye on the "boy" and "girl" packs! Those characters are so darn cute! 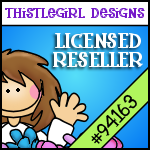 I'm a lifetime member of Thistle Girl Designs and have a Reseller License. Great giveaway. I'd love to purchase the Dr. Seuss Kids. I'm already a follower of your blog and love all your wonderful ideas and post. You have become the queen of blog buttons. Already a follower of Ashley's Blog too! I've tweeted about the contest! I've made a post on FACEBOOK too! I would love to get a reseller's license from Thistle Girl and it's definitely on my wish list. (I actually asked for it for my birthday). But, I also LOVE the safari babies. I follow ThistleGirl and added her to my Google Reader. I love Thistle Girl!!! I just started cooking with my kids this year and would love to have the Baking Bliss set. Thanks for all of the awesome things you make!!! I'm a follower of your blog now and am looking forward to delving in and checking all of it out. Love what I have seen so far. I love it all at Thistle Girls BUT I would put it toward a lifetime membership because I love so many different sets...like picnic, detectives, etc. I follow Thistle Girl's blog. I follow your blog. If I won I would get the hollywood set. I love it! 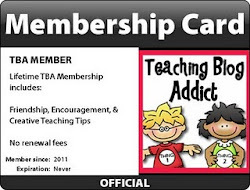 I might just have to get a lifetime membership too. I think I would put the $15 toward a lifetime membership...love Thistle Girl!! I follow your blog! Thank you for your ideas! I would put it towards a membership if that was an option. If not the Hippie Kids. I have been following your blog. I have been an avid follower of your blog! I now follow Thistlegirl Designs Blog! If I won I would use the $15 towards a membership. That way I would be able to use all the cute graphics on my website and blog. I especially like the Hippie kids since that is my theme for the year! I love Thistlegirl Designs! I would get some of her Sports Theme packs for my classroom theme! I am following the thistle girls design blog! Hi! I follow your blog! I follow and love Thistlegirl Design blog! I follow Thistlegirl Design's blog too! I would use the &15.00 on the "Picnic Pals." Picnic is our new theme for kindergarten at our school next year! I adore ThistleGirl!!! I would definitely get the Dr. Seuss collection. I love it! You are so sweet! I love your favicon, I love following your blog and I plain love you BBFF!! hehehe! I have a membership to ThistleGirl too! I would love to get the Fireman Friends or Post Office Pals! I follow their blog too!! Not sure I can only pick ONE thing!!! I love Thistle Girl Designs! I am a big fan and follower of her blog! Thanks for the comment. Please come back again.